With all the excitement and hype for Episode VII, it’s not surprising that there is a new Star Wars cereal out. What is surprising, however, is that this cereal has absolutely nothing to do with Episode VII, and is just an arbitrary Star Wars cereal. That’s still cool, though. It’s Star Wars, after all. After the surprising twist on Cinnamon Toast Crunch of Minions cereal, here we are with another cereal piece and marshmallow effort. Thankfully, I assumed no matter how good or bad this might turn out to be, it would have to be better than my previous Star Wars cereal experience. 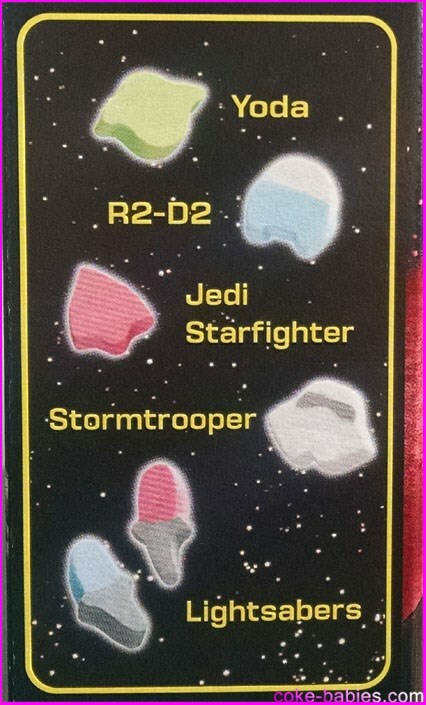 There are two box designs – a Vader and a Yoda. I went with Vader because, well, it’s Darth Vader. That’s all the explanation necessary. As supplementary reasoning, the Yoda was the CG Yoda, and no thanks to that. Puppet Yoda is my Yoda. 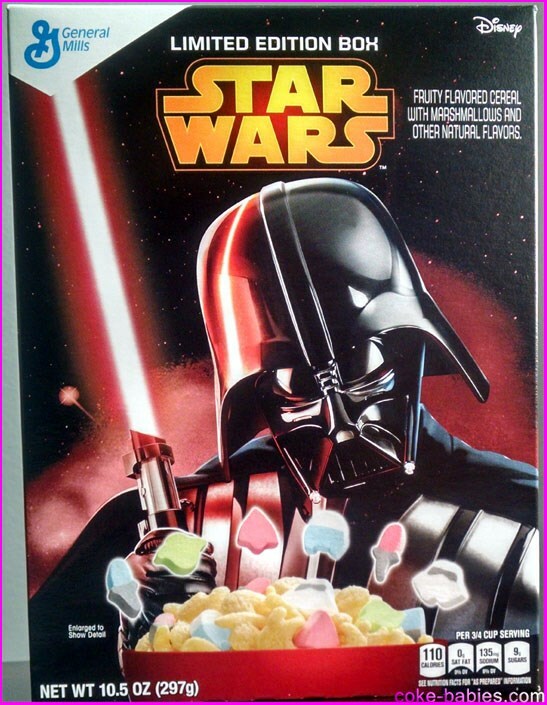 The box design is very nice, blacks and reds for Vader, and a shot of the cereal and marshmallows at the bottom. The only real downside is that it’s the Revenge of the Sith Vader suit and helmet, but as a cereal box mascot he still looks as imposing as ever. Weighing in at a paltry 10.5 oz, we’re back in prime licensed cereal territory. It’s a small, light box – but at least it has the decency to have an eye-catching design. I didn’t take a picture of the back of the box because all it is is a game of Star Wars checkers. Come on. Since most of the time licensed marshmallows tend to look nothing like their “inspiration”, the side of the box provides a handy guide. Yoda and Stormtrooper look good, but the others are just lazy. The lightsaber is a decent attempt, but the stumpy shape makes it look more like a tube of lipstick or an ice pop. I will move on from the marshmallow discussion, because I’m feeling very self conscious about sounding like an Onion editorial. The cereal itself isn’t particularly attractive – the cereal pieces are a sickly shade of yellowish-tan, and feel very light for their size. The marshmallows look pretty good, most of their advertised shapes held up, and the colors are relatively bright. Flavor-wise, it’s quite good. 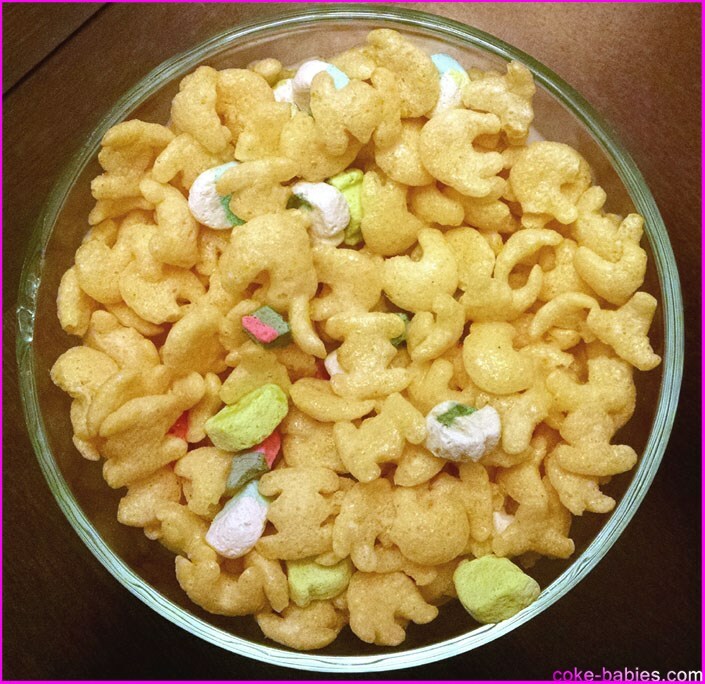 The cereal pieces are very lightly fruit flavored – or, more accurately, “froot” flavored. The flavor reminds me a lot of Prince of Thieves cereal, or what I remember that cereal tasting like, anyway. The Star Wars cereal pieces are a lot less phallic than the Prince of Thieves’ pieces, though. It’s sweet enough, but definitely not overwhelmingly so – almost restrained, given that this is a sweetened Star Wars cereal. Since this is a temporary licensed cereal, I won’t be too heartbroken when this cereal goes away – especially since a nearly identical cereal probably isn’t too far off. But this was much better than it needed to be, given its “license to print money” Star Wars lineage.